Use convenience foods to build a delish and nutrish Peanut Asian Rice Bowl! You’ll ring the dinner bell in less than 10 minutes with healthy foods, conveniently. Heat oil in a large skillet over high heat for 1 minute. Add frozen vegetables; stir regularly for 5 to 7 minutes. 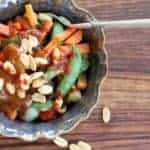 To make two bowls, layer rice, top with vegetables, peanut sauce, peanuts. Drizzle with Siracha.